You may think that as long as you have an area that is large enough for the best trampoline length and width, it is enough. It is, however, important to look above the trampoline. People will bounce higher than you expect. If your trampoline is outside, you should place it away from clotheslines, fences, trees or any other item that could cause injury. There should be enough space around the trampoline, at least 10 feet so that someone falling off the trampoline will not go head first into an object nearby. Padding the area around the trampoline is also a good idea. The preferred distance is 10 feet. 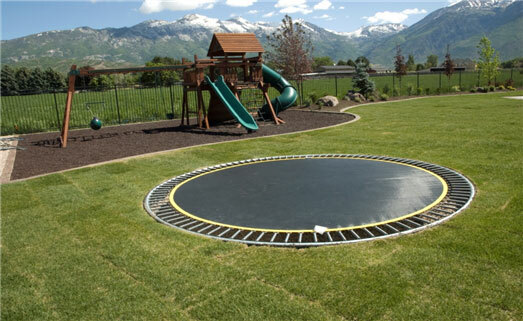 Place your trampoline partly into the ground so that anyone falling off does not fall quite far. You can either place your trampoline into a pit or partly submerge the support and legs into the ground in order for the top of the trampoline to be at ground level. Wearing the right clothing is also important to allow the jumper to move freely. Get rid of any extras such as the contents of your pocket and jewelry. Your clothes should be loose enough. If you don’t have a pair of special trampoline footwear, you can go barefoot. Don’t wear socks if you don’t want to slip and lose your balance or fall off the trampoline. Kids can get excited when there is a trampoline. Two or more might climb on and jump around together. Unfortunately, the risk of injury is also higher. They may crash into each other or fall off. Thus, you have to make sure that only one person is using the trampoline at a time. Everyone else should stand a good distance away from it and not lean against the sides of the trampoline. It’s easy to get carried away and think that you can do somersaults on the trampoline without any problem. Unless you’ve had proper training, you should not try doing somersaults on the trampoline. If you land the wrong way, you could sustain serious injuries. If you have had some basic training, you can give some basic pointers to your child or other jumpers about how to do simple tumbles properly. Undertaking some basic first aid training is also a good idea so that you’ll know what to do in case someone falls off and sustains an injury. You can also enroll in a trampolining course. This way, you can learn the proper methods of dismounting and mounting and some simple moves. Follow these tips and you can enjoy your trampoline more while ensuring your safety at the same time.